As a follow thru to our prior post on Sierra Leone's lax security in its Freetown-Lungi International Airport, readthis colorful description of how things work there. Infamous for the astonishingly bad urban planning which located it across a large body of water from the capital city, Lungi is also notable for being the approximate size of a postage stamp. 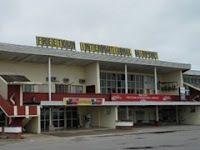 One runway, bordered by broken-down planes and a debris-strewn grassy plain, leads to an unimpressive two-story building with gap-toothed yellow-and-black letters spelling out Freetown Freetown Air Port Arrival International Airport. Inside are perhaps 5 main areas – lobby, departures immigration, security and departure lounge, arrivals immigration, and baggage claim. All together, the airport’s square footage is probably about the same as two average middle class American homes. Now, security at Lungi is profoundly questionable at the best of times. There is no metal detector, no x-ray scanner, no narcotics-trained bloodhounds. Security consists of a cursory search (repeated three times but never involving more than a superficial rifling) of all luggage, and a physical pat-down to check for weapons or contraband. First problem: it would be profoundly difficult for this process to uncover any but the most blatantly obvious breaches of law or security. When someone opens my backpack zipper, peers inside, and then zips it closed again, they’re apt to miss anything smaller than an AK-47. As proof, I can tell you that I have on several occasions brought 1.5-liter bottles of water through security in my carry-on backpack without detection. (Purely accidentally, of course – I have the utmost respect for the “put your 3-oz facial moisturizer in a plastic baggie and we’re all safe” rule, and would never try to smuggle extra drinking water on board.) In case you’re not clear, a 1.5-liter bottle of water is quite large. Almost the size of a big jug of Coke. If they can’t find that, how exactly will they find hidden narcotics or diamonds? Second problem: it is tremendously easy to bypass this procedure entirely. You don’t have to be much of a VIP or pull too many strings to find someone to walk you straight out onto the tarmac and on board the plane. If my businessmen friends can do this with one simple phone call because they’re late and want to catch their flight, a cocaine baron could clearly arrange something of the sort to facilitate his multi-million dollar cargo. And anyway, the grounds of the airport are totally open to the surrounding community, so pretty much anyone can wander in and out as he pleases. But all these problems pale in comparison to what happens when the security officers themselves stop taking their job very seriously – or at all seriously.